- Publisher Your Hurt Child Can Heal and Grow. 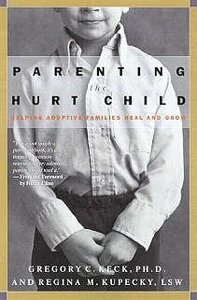 When a child is adopted, he can arrive with hurts from the past-pain that stunts his emotional growth, and your family's life, too. At some point your parenting dreams can shatter, and raising a hurt child becomes more like a burden than a blessing. But don't give up. With time, patience, informed parenting, and appropriate therapy, your adopted child can heal, grow, and develop beyond what seems possible now. From insights gathered through years of working with adopted kids who have experienced early trauma, Gregory C. Keck and Regina M. Kupecky explain how to manage a hurting child with loving wisdom and resolve, and how to preserve your stability while untangling their thorny hearts. "We hope that what we share will give you strength, courage, and commitment," write the authors. "We hope you will tap into your own resources and creativity to become the parent you've always wanted to be." If you've adopted a child, whatever the circumstances, you'll find hope and healing on these pagesfor you, your family, and especially your adopted child. About "Parenting the Hurt Child"
Your Hurt Child Can Heal and Grow. When a child is adopted, he can arrive with hurts from the past-pain that stunts his emotional growth, and your family's life, too. At some point your parenting dreams can shatter, and raising a hurt child becomes more like a burden than a blessing. But don't give up. With time, patience, informed parenting, and appropriate therapy, your adopted child can heal, grow, and develop beyond what seems possible now. From insights gathered through years of working with adopted kids who have experienced early trauma, Gregory C. Keck and Regina M. Kupecky explain how to manage a hurting child with loving wisdom and resolve, and how to preserve your stability while untangling their thorny hearts. "We hope that what we share will give you strength, courage, and commitment," write the authors. "We hope you will tap into your own resources and creativity to become the parent you've always wanted to be." If you've adopted a child, whatever the circumstances, you'll find hope and healing on these pagesfor you, your family, and especially your adopted child. Gregory C. Keck Ph.D., is the founder and director of the Attachment and Bonding Center of Ohio. He and his staff treat a variety of difficulties in children and families including adoption issues, reactive attachment disorder, adolescent problems, child abuse/neglect, and sexual abuse. He has provided training to thousands of professionals in the United States, United Kingdom, Australia, and New Zealand. Dr. Keck has also appeared on numerous television and radio shows to discuss a broad spectrum of adoption issues. Regina M. Kupecky, LSW, has worked in the adoption arena for over twenty-five years as an adoption placement worker. She is currently a co-therapist with Dr. Gregory C. Keck, Ph.D., at the Attachment and Bonding Center of Ohio. Mrs. Kupecky authored a resource guide, Siblings Are Family, Too, which is available through the Three Rivers Adoption Council in Pittsburgh, Pennsylvania. She has presented at local, national, and international conferences on a variety of adoption topics and holds a Master of Arts degree from John Carroll University.